We’d love your help. Let us know what’s wrong with this preview of Oscar Wilde and the Return of Jack the Ripper by Gyles Brandreth. When it appears that the notorious Jack the Ripper has returned to London, Chief Constable Melville Macnaghten recruits his neighbor Oscar Wilde to help him solve the case, hoping the author’s unparalleled knowledge of the London underworld might be exactly what the police need to finally capture the serial killer. In an account narrated by Wilde's close frien London, 1894. 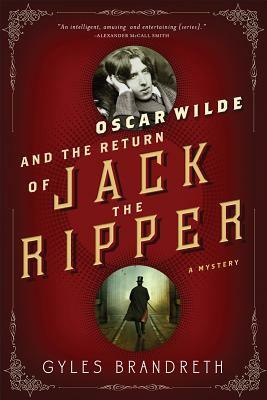 To ask other readers questions about Oscar Wilde and the Return of Jack the Ripper, please sign up. Is this the same book as #7 in the Oscar Wilde series, "Jack the Ripper: Case Closed? Scarlet No, this is a sequel to that. Number 8. The seventh book in Gyles Brandreth's Oscar Wilde mystery series, "Oscar Wilde and the Return of Jack the Ripper", is the first that is not told from Wilde's viewpoint. Instead, this witty and fast-paced outing is recounted by Arthur Conan Doyle, creator of Sherlock Holmes and a real-life friend of Wilde. Not surprisingly, this deliciously twisty mystery works just fine as a stand-alone thriller. And although this entry is a bit darker than the previous mysteries, it is still an enjoyable romp. The seventh book in Gyles Brandreth's Oscar Wilde mystery series, "Oscar Wilde and the Return of Jack the Ripper", is the first that is not told from Wilde's viewpoint. Instead, this witty and fast-paced outing is recounted by Arthur Conan Doyle, creator of Sherlock Holmes and a real-life friend of Wilde. Not surprisingly, this deliciously twisty mystery works just fine as a stand-alone thriller. And although this entry is a bit darker than the previous mysteries, it is still an enjoyable romp. There are plenty of charming scenes between the two bantering friends, and Wilde's clever and acerbic observations are constantly entertaining. Six years after the notorious Jack the Ripper murders in London's impoverished Whitechapel district, Chief Constable Melville Macnaughten contacts the two amateur sleuths about a new murder that appears to be the work of the same psychopath. Except this murder has taken place in an alley behind Tite Street--where both Wilde and Macnaughten have homes. With the permission of the police, the duo studies the case files of the first five victims and start eliminating previous suspects and interviewing new ones. Meanwhile, Wilde's messy personal life brings him dangerously close to ruin when his devoted and loving wife begins circling the same orbit as his latest male infatuation. Fans of Doyle and Wilde will find the pair fully developed and fascinating company. And Brandreth's extensive research into the Whitechapel Murders produces a solution that is sound, satisfying and original. A delightful police procedural not to be missed. Read my upcoming review on Criminal Element.